17-year-old champion boxer Simran Kaur; Marian Partington, sister of Lucy, murdered by Fred and Rose West; menopause and work; Emma Morgan's debut novel; and fertility clinics. Monday 25th February is 25 years to the day that serial killer Fred West confessed to the murder of his daughter Heather, and the first set of remains were excavated from 25 Cromwell Street, Gloucester, crimes for which he and his wife Rose were found guilty. Lucy Partington was one of their victims, an English student in her final year at Exeter University who vanished while waiting for a late-night bus. For twenty years her family didn’t know what had happened to her. Her sister Marian, author of 'If You Sit Very Still' speaks to Jane about her journey from “murderous rage” towards her sister’s killers, to a vow she made to bring something positive out of Lucy’s death. Menopause and the workplace: What are employers doing to help women with menopausal symptoms? We hear from Deborah Garlick founder of the over 40’s website, Henpicked. Emma Morgan’s debut novel, 'A Love Story for Bewildered Girls', follows three young women in Leeds and their adventures in love. One knows she likes women, one men, and one just isn’t sure. Is it rare to see so much sexual diversity in romantic fiction? She joins us to discuss. 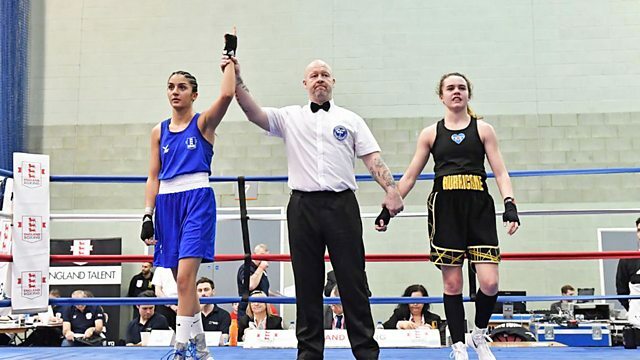 Boxer, Simran Kaur, National youth champion, has just won a fifth consecutive National ABA crown. What is it like to already have such success at just 17?